Is there a meal more comforting than spaghetti and meatballs? Not in my world. It is my go-to dish when I tire of the trendy or the technically difficult. I grew up in New Jersey, where spaghetti and meatballs is on someone’s table 365 days a year, and everyone has his own version: Vermicelli instead of spaghetti. Pecorino cheese. No, Parmesan. Lots of bread in the meatball – makes it fluffy. Some people use cooked rice. Red pepper flakes? Loathed or loved. Meat in the sauce? Blasphemy with spaghetti and meatballs. You just don’t eat meat with meat sauce, paisan. Capisce? 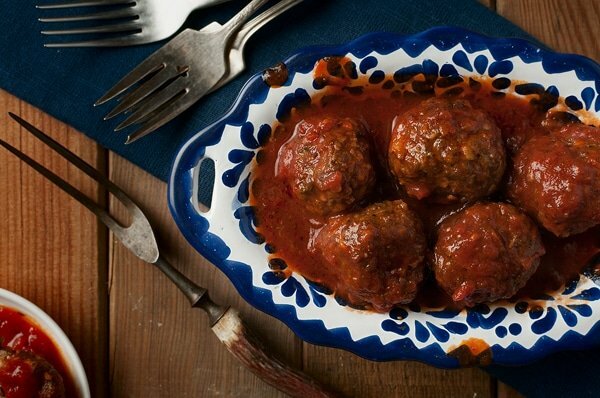 Traditionally these Greek meatballs are golfball-sized, more or less. It is a good size, big enough to retain moisture, and you get to cut the ball with your fork, making sure every freshly cut side gets anointed with the tomato sauce that must accompany this dish. 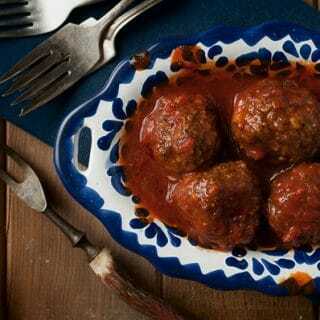 Traditional Italian meatballs are also made with a combination of veal, beef and pork. But these are not traditional Italian meatballs. They are Greek, and there is a difference, as you will soon see. And, since I no longer buy meat, these meatballs are made from venison. Wild boar, bear, chicken or really any ground meat will work fine. What makes these Greek meatballs They use bulgur wheat instead of bread. If you’ve ever had tabbouleh, you’ve had bulgur. 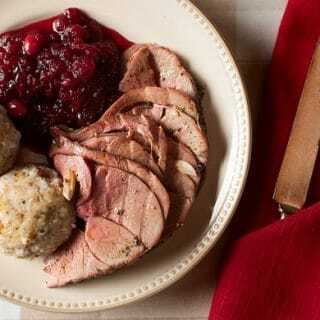 I like bulgur, its coarse earthiness compliments the venison. Using bulgur changes the texture of the meatballs, making them firmer and a little meatier-tasting than those with bread. No bulgur? OK, use bread crumbs. Are they are light as a perfect Italian meatball? No, but they are not supposed to be. These are substantial meatballs, flavored with lots of garlic, parsley and oregano. Make your traditional tomato sauce more Hellenic by adding sweet wine and cinnamon, and by grating mizithra cheese on it instead of parmesan or pecorino. Kali Orexi! This is a riff off traditional spaghetti and meatballs, with a Hellenic touch. It jazzes up one of my favorite comfort foods with a bit more garlic, a bit more sweetness and a chewiness from the bulgur wheat. These are not the fluffy meatballs of an old “red sauce” restaurant, nor the dry orbs that most wild game meatballs become. Any meat works here, by the way. Serve this with spaghetti and grated mizithra cheese, if you can find it. Pecorino or parmesan is just fine, too. Start by getting the meatball mixture ready. Mix all ingredients in a large bowl. Cover and refrigerate for at least an hour to let the bulgur absorb moisture. Two hours is better. To make the sauce, drain the olive oil from the anchovies into a large saute pan. Over medium-high heat, saute the onions until they are translucent, about 3 to 5 minutes. Add anchovies, mash in the pan and combine with the onions. Add the tomato paste and stir to combine. Cook this until it turns a deep maroon, about 4 minutes. Add the wine and stir to combine. Add the cinnamon stick and bring to a boil. Pour in the crushed tomatoes, combine well and add the oregano and salt. Cook this uncovered over medium-low heat for about 10 minutes. Stir occasionally. If you feel adventurous, run this sauce through a food mill on a medium setting – after you remove the cinnamon stick. Keep warm while you make the meatballs. To make the meatballs, take the meat out and knead it until it forms a cohesive mass. Take an ice cream scoop or tablespoon and make your meatballs. Heat the olive oil in a large saute pan over medium-high heat. Brown the meatballs well in batches so you don't crowd the pan. Set each browned meatball in the sauce to simmer as they come ready. When they are all in, cover the sauce and simmer gently over low heat for 15 minutes before serving. NOTE: My ground venison always has pork fat ground with it. If yours has no fat in it, you will need to add some. I'd recommend adding 1/4 pound of bacon to your grind in this case. Some people like ultra lean ground venison, but I am not among them. You can find more than 100 recipes for all kinds and all cuts of venison here on Hunter Angler Gardener Cook! I used ground antelope & used 1/2 the crushed tomatoes because I served the meatballs without pasta to 4th graders at a feast. They loved them! I didn’t advertise the anchovies as an ingredient as I wanted everyone to at least try them. They couldn’t get enough. Thank you for the super recipe. It will be my new go to for meatballs. I loved the texture the bulgar wheat added too them. Is the recipe supposed to say 1-1/2 venison and 1-1/2 other ground meat? Or is it just a duplicate of “1 1/2 pounds”? Outstanding! I honestly was a little worried about what adding the cinnamon sticks might do to the flavor of the sauce. As it turns out, it imparted an incredible, yet subtle layer of flavor that I would have never thought to add to a meatball sauce.